Illustration: Detail from a chromolithograph in Jornal de Horticultura Pratica, 1871, Vol. II, p.2, painted according to nature at Horto Loureiro by Frederico Pellereau, engraved by L. Stroobant, Gand in Belgium, and digitally remastered by Armando Oliveira, 2012. Originator: Unknown, found in a backyard by José Marques Loureiro, in January 1870, near Porto. This is one of the more prize winning C.japonica varieties of Portuguese origin in the latest national contests in Portugal. Duarte de Oliveira was a very cultivated person and also a remarkable horticulturist and camellia enthusiast. In 1870 he founded with his great friend José Marques Loureiro the Jornal de Horticultura Pratica, of which he was editor for 18 years, participating with many interesting articles. His monthly “Chronicles” are a main source for research on Portuguese horticulture in the 19th century. 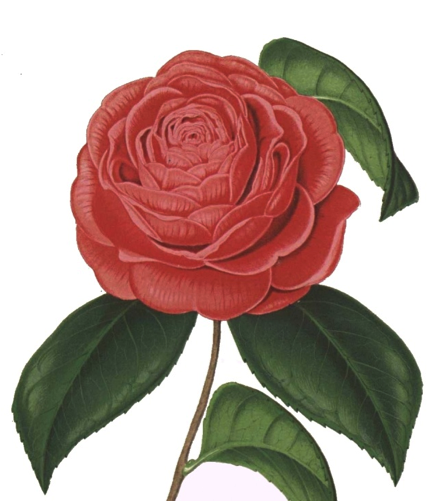 Later, in 2000, this error is absorbed by Veiga Ferreira and his wife Maria Celina in the book O Mundo da Camélia, p.80, where they describe this camellia as: “...Wine red colour with white blotches, anemone form, large, blooming late” as legend to a colour photo of a flower that doesn’t correspond to Duarte de Oliveira but to Gigantea. In a recent Portuguese contest, owing to the efforts of António Assunção, this error was eliminated. 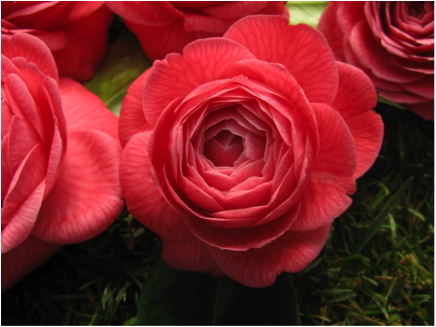 The beauty, splendour and colour of this camellia are finally standardized and national nurseries are beginning to produce again this marvellous flower. Viveiros Albar, Fânzeres; Viveiros Flavius, Guimarães; Casa da Compra, Amarante.